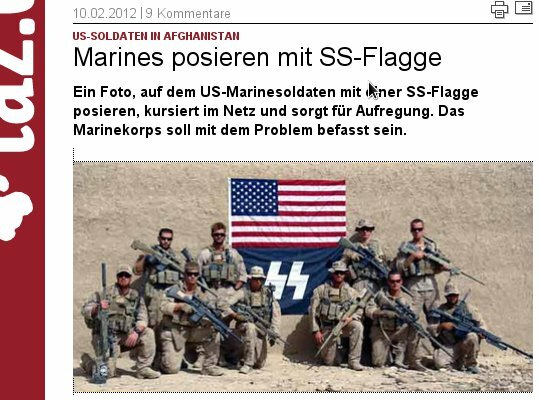 In den USA ist ein Foto von US-Marine-Scharfschützen in Afghanistan aufgetaucht, die vor einer SS-Fahne posieren. Die Soldaten, die auf dem online zu findenden Foto zu sehen sind, gehörten laut Armee-Pressesprecher nicht mehr der Einheit an. Das Foto war im September 2010 in Afghanistan gemacht worden. That 70 years after the United States Armed Forces helped liberate Europe from Nazi Germany, to learn that a unit of the United States Marine Corps serving in Afghanistan adopted the SS insignia alongside the Stars and Stripes, desecrates the memory of some 200,000 Americans who gave up their lives to defend freedom against that infamous symbol. The SS units bore the principal responsibility for carrying out Hitler’s Final Solution, which led to the extermination of six million Jews including a million and a half children. In addition, members of the SS murdered unarmed American POWs from Normandy to the Battle of the Bulge. We call on President Obama and the Secretary of Defense Panetta to immediately investigate on how such an outrage could have occurred and to discipline all those involved. In addition, it is clear that younger generations entering the US military need to be better educated about the lessons of World War II and the Holocaust. The Simon Wiesenthal Center stands ready to assist the US military in an ongoing education effort.